Scream Acres was a brand new haunt for the Tourers in 2014. Located in an old barn that is part of a Family Fun Farm complex, we were not sure what type of haunt we were going to get, but the old barn set int he back made the atmosphere a good one! The barn itself was well lit with some atmospheric lighting, and the numerous live actors milling around outside made for some good wait entertainment. They ranged from silently creepy to loud and crazy, and there were about 5 or 6 of them. Given that we were the only ones waiting when we arrived, we had their full attention. All stayed in character and continued to pay attention to us the entire time we were outside. 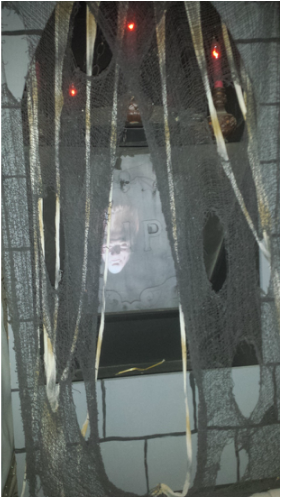 The inside of the haunt was fairly typical, with scenes set here and there, with dark corridors in between. Some interesting scenes included a creepy clown room with a clown-related surprise inside, a live actor who warned us about Sasquatch, which we later saw stuck to the front of a truck (not something you see every day in a haunt), a creepy ghostlike female figure inside of the crypt with moving skeletons that came towards visitors, and a cool corridor that had glow in the dark scrawls on the walls that flashed on and off as the lights went up and down. The ending, too, was quite good, with a cool horror movie related scare at the end. While we enjoyed the haunt, it was a bit short (about 8 minutes), especially for the $15 entry fee. If the price were lower or the haunt was longer then it would be a better value. It is good for kids, though, and it's family friendly as well. Not in your face or intense. A good effort for a first year (and far better than a few other first years efforts we've seen so far). We're looking forward to seeing some growth in years to come.